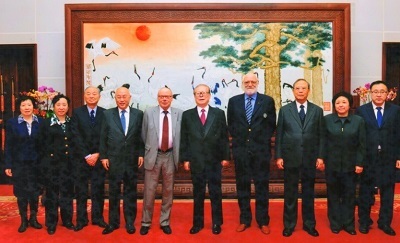 The WBF President Gianarrigo Rona and the WBF President Emeritus José Damiani had the great honor and privilege to have been received by the Former President of the People’s Republic of China Mr. Jiang Zemin. 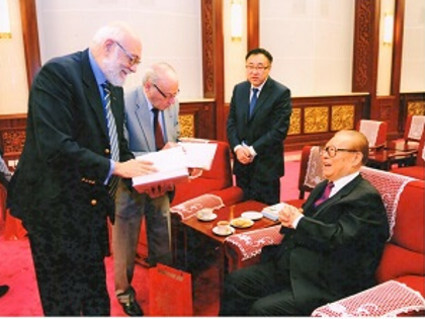 Rona and Damiani had the opportunity to play bridge with Mr. Jiang Zemin and join with him for lunch afterwards. The President gave Rona and Damiani his three-volume Selected Works as a present. The bridge game was played with such good spirit and was extremely enjoyable, played in a warm and friendly atmosphere. Rona and Damiani were very impressed with the President Jiang Zemin’s obvious enjoyment of the game and with the skill he displayed. During lunch they greatly appreciated hearing of the President’s time in office and his very interesting stories of meeting so many of the eminent politicians at that time. The meeting was also attended by the President of the WBF Congress Mr. Zeng Peiyan, the President of CCBA Mr. Xiang Huaincheng, the WBF Executive Council Member Mrs. Chen Zelan and the President of the Beijing Bridge Association Mr. Wan Siquan and the group is pictured below.